Starting from Inverness - the Highland Capital - and making a complete circuit around Loch Ness, the 360 is set to become a popular option for long distance walkers, being easily completed within a week. The first half of the trail follows the Great Glen Way above the north side of Loch Ness, reaching Fort Augustus in three stages. 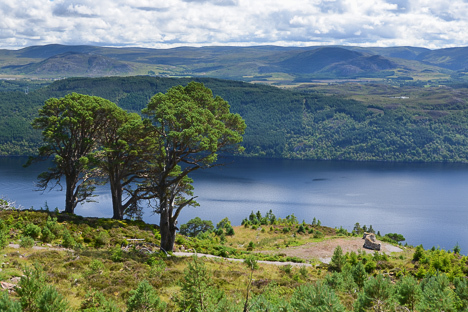 Our complete description follows the high level variants for some superb views over Loch Ness along the way. Once at Fort Augustus, the second half of the route follows the South Loch Ness Trail for its complete length to Torbreck on the fringes of Inverness, finishing with a further 5.5km along the roadside to head back to Inverness Castle. The first half on the Great Glen Way is very well signed; the second half on the South Loch Ness Trail also follows tracks and footpaths throughout and is mostly waymarked. Click to find organised Loch Ness 360 walking holiday packages and baggage transfer providers. Inverness is the capital of the Highlands, a city with all facilities and excellent transport links. Drumnadrochit has a good choice of guest houses and hotels. There is also an independent hostel and campsite. Invermoriston is a smaller village with shop, cafe, hotel and bed and breakfast accommodation. Fort Augustus is popular tourist centre with shops, cafes, restaurants and all types of accommodation. Whitebridge is reached around 18.5km after Fort Augustus and has a hotel / inn. Foyers is a small village with a shop, cafe and a choice of accommodation, including B&Bs, guesthouses and hotels. Dores has an inn/restauraunt and bed and breakfast accommodation, but no shop. Inverness has excellent transport connections, including by bus and train. Buses link all the settlements on the north side of the loch, including Drumnadrochit, Invermoriston and Fort Augustus. Buses from Inverness reach as far as the Knockie Lodge road end on the south side of the loch, calling at Whitebridge, Foyers, Inverfarigaig and Dores. There are 3 Walkhighlanders who have completed the Loch Ness 360. To record if you have completed the route, you must register and be logged in. Our users have contributed one public walk report for the route.